Emily, a talented but hard-to-classify comedic performer who left behind her home and boyfriend to pursue career opportunities in L.A. 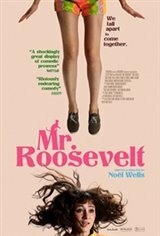 When a loved one falls ill, Emily rushes back to Austin where she's forced to stay with her ex-boyfriend (Nick Thune) and his new-and-improved girlfriend (Britt Lower), a totally together woman with a five-year plan.Though Emily is the same, everything else is different: her house has been smartly redecorated, her rocker boyfriend is training to be a real estate agent, and her old haunts show serious signs of gentrification. Holed up in her own guest room, Emily--who has no idea what she'll be doing five days from now, let alone five years--is forced to question everyone's values: are they sell-outs or have they just figured out what makes them happy? And is she following her dreams or is she just a self-absorbed loser?